(Boston, MA) If one scratches the surface of theatre history, information on Moss Hart and his great effect comes spilling forth like a Texan hitting oil in his backyard. He was beloved by most, if not all, for his contributions. He worked with greats such as George S. Kaufman, Kurt Weill, and Ira Gershwin. He co-wrote countless musical reviews (I’d Rather Be Right), directed some hits (Camelot), and wrote several award winning screenplays (A Star Is Born). He was a gentleman, a scholar and pretty great guy. Light Up the Sky is a twee but surprisingly sincere ode to outspoken theatre creators and the quiet people who adore them. 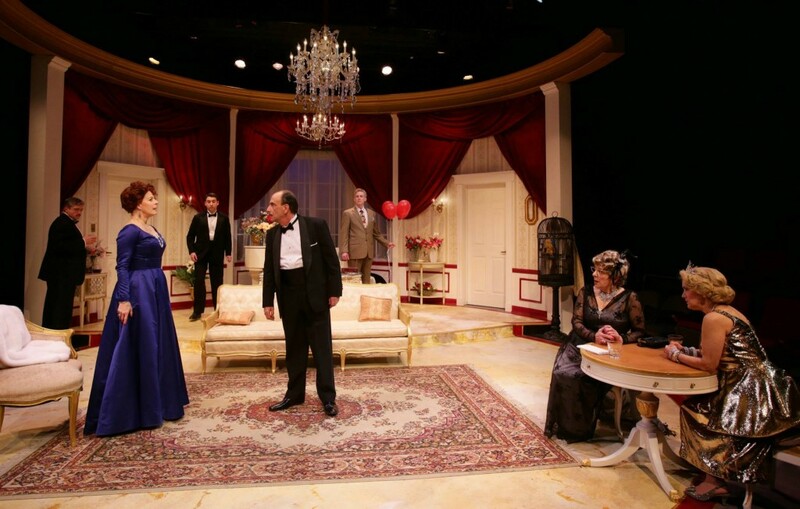 At once, we are introduced to a loud, proud and ridiculous cast of characters on opening night of an unforgettable play with a forgettable title having its first tryout in Boston (see the dramaturgy notes by A. Nora Long for more info on this). Diva Irene Livingston (Paula Plum playing the part of Bette Davis as Irene Livingston), producer Sidney Black (Will LeBow), and director Carleton Fitzgerald (Will McGarrahan) anticipate the performance in their own unique yet melodramatically similar ways. A cast of supporting characters of family and friends, respond to their theatrics with the stoic reserves of martyrs… Except for the playwright, Peter Sloan (Alejandro Simoes), who can’t cope with all the offstage drama that accompanies his play. Egos are pummeled, threats are made, but in the end it’s another beautiful day to be in the Biz. LeBow and Kathy St. George (as Frances Black) chewed the scenery together delightfully. They made a realistic, sassy pair. LeBow had the audience in the palm of his hand. He wasn’t delivering monologues so much as prepping for his 5 minute standup set. Bobbie Steinbach was an unforgettable stage Mom with a heart of snark. She was an excellent foil for McGarrahan. She was the sour to his whiskey. Actually, the only loose cog was was Jordan Clark – who normally gives a splendid performance regardless of her role. In this production, she was wooden. It’s so strange because this is very much not her MO. One can’t always be successful. I’m sure she’ll be back to blowing our hearts and minds soon. The play is funny and touching. It isn’t a musical but does include darling performances of Cole Porter’s “Another Op’nin, Another Show” and Noel Coward’s “Why Must the Show Go On?” sung by the cast. It’s a slice of classic Hollywood grandeur set on the stage. Fans of the classics will love this one. Everyone else should see it because it’s wonderful. This entry was posted in Comedy and tagged 2015, A Star Is Born, A. Nora Long, Alejandro Simoes, Another Show”, “Another Op’nin, “Why Must the Show Go On?”, Bette Davis, Bobbie Steinbach, Boston, Camelot, Cole Porter, George S. Kaufman, I'd Rather Be Right, Ira Gershwin, Jordan Clark, Kathy St George, Kitty Drexel, Kurt Weill, Light Up the Sky, MA, Mark S. Howard, May, Moss Hart, Noel Coward, Paula Plum, Scott Edmiston, Will LeBow, Will McGarrahan by Kitty Drexel. Bookmark the permalink.